Nancy knew how important it was to keep her 4 year old Evie active and engaged with various activities both indoors and outdoors. But, since the time Evie got her Christmas gift (a cool new iPad) from her dad, she’s just glued to it. Even though Nancy and her husband made sure that Evie engaged only with educational and child appropriate content on her iPad, they were still concerned about her increased screen time which was making here more and more physically inactive. Luckily for Nancy, we already had an answer to that question! After the phenomenal success of our dance games, we were already exploring fun new motion based game ideas for Kids to play with. That’s when we decided to build this awesome new game – Rub Scrub! Rub Scrub is a fun motion Based Game for Kids where children use their hands and their body to clean funny mirrors and reveal their funny faces on them! This funny faces game for Kids uses different sensors on your mobile and turns it into a motion tracking gaming device. This Kaju app uses the front camera on your device to track your child’s body movements which are then used in the game play. This Kids app also has a wireless casting option so that you can cast this game on your TV from your phone. Wireless casting works on Android TV, Apple TV or any TV connected with a Chromecast device. It’s simple. All you have to do is turn on the app and place your device against a flat surface. You can also build this cool mobile stand to hold your device while playing our fun motion controlled games. Once you have set the device on a flat surface, ask your child to stand in front of it and start using their hands and body to clean the mirror and discover if it’s a funny mirror. Once a mirror is cleaned the game will move on to the next mirror. Children earn points based on how quickly and how many mirrors they can clean before the timer expires. The player with the highest points wins. If you want, you can join in the fun too! When can children play the RubScrub game? 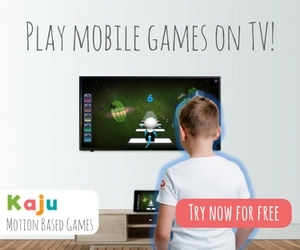 – Kaju’s motion based kids games can be a fun activity for your child’s birthday party. – Our motion based kids games can also double up as fun and engaging indoor activities. So it will be a good option to keep them active and wear out their energy when you cannot take them to the playground/garden due to snowfall, rain etc. – RubScrub can be a fun activity for your child’s play date! Have a fun time cleaning funny mirrors and do share your feedback in the comments section below! ← 2017 was an exciting year for Kaju!